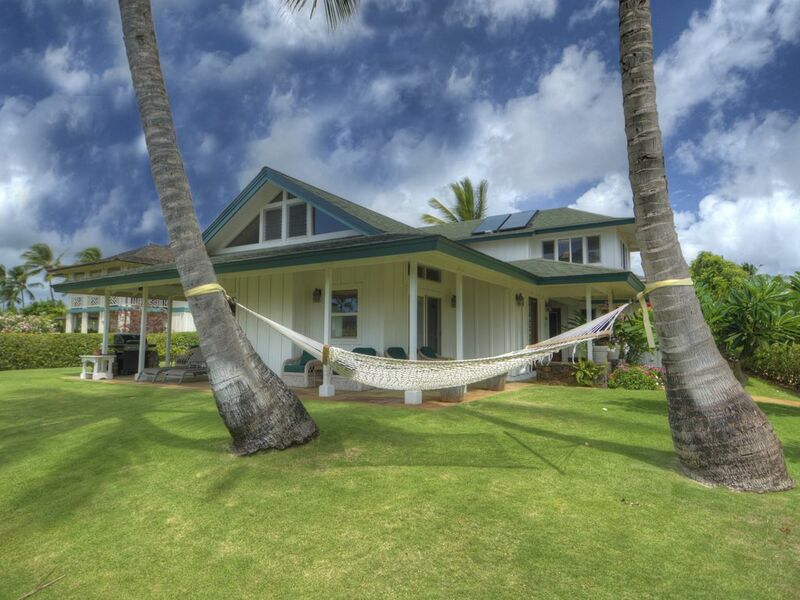 Maluhia ma ka Honua means "Peace on Earth" and that is what you will find in this beautiful house located just a 40 second walk to the ocean and just four houses from famous Brennecke's Beach in Poipu Beach Park. Like most people, you immediately stare at the 14' high vaulted wood ceiling. Then you open the five sliding doors into this great room and it is almost like living outdoors as the cooling trade winds that make Kauai so special waft through the room from three sides and the three ceiling fans cool the room further. In this great room there is a fully-equipped modern kitchen, a casual eating bar for four, a glass oval dining table for eight under a beautiful chandelier, a game table for two, and entertainment seating for seven! Outside under the 1300 sq. ft. covered lanai two more dining tables for four each and casual seating for six. Maybe you start to imagine sunrise coffee under the east lanai and sunset cocktails under the west lanai. Or maybe you see that there is plenty of lawn for the children to play on and chaise lounges for sunbathing when you don't feel like walking the few steps to the beach. Each bedroom brings new delights and each bedroom has three-sided ventilation and a ceiling fan that normally keeps the bedroom so cool that blankets are needed for sleeping. The spacious downstairs master bedroom suite has a king-size pillow top bed and oversized bamboo bedroom furniture with a television, a large walk-in closet, and two glass sliding doors leading to the covered lanai and the lawn. Its private bathroom has two lavatories, an oversized glass block and tile shower, a two-person Jacuzzi tub, and a separate toilet compartment. The heated outdoor shower is just outside this bathroom. The equally large upstairs master bedroom is almost identical to the one downstairs except this one has a vaulted wood ceiling and a nice ocean view balcony. . Over the bed is an original oil painting of Hawaii by famed artist Ezra Muir. The bathroom is identical to the downstairs bathroom except it has a two-person soaking tub. The third bedroom is the largest bedroom and has a great ocean view. It has two twin beds that can be converted to a king bed, a vaulted wood ceiling and rattan furniture. Its bathroom has one lavatory, a toilet and a tub/shower. The fourth bathroom is the powder room downstairs complete with a tiled shower. The laundry room features a washer, dryer and a soaking sink. This house is equipped with everything you need. All kitchen and bathroom needs, all laundry needs, linens, beach towels, beach chairs are provided. You might even find previous guests have left sand toys, boogie boards, and/or snorkeling gear. Come to Poipu and experience a true Hawaiian beach experience! Like the Hawaiians, come to the beach, gather at the sand and spend hours 'talking story'. Use the sparkling blue Pacific Ocean as your swimming pool. Laugh and enjoy the weather and life. Maluhia ma ka Honua was designed to offer an old Hawaiian beach experience with all the modern amenities and comfort and with the ocean as our swimming pool because it is so close to the house. Isn't this why you are coming to Poipu, for the weather, the beach, and the ocean? Previous guests have responded by loving this house and having some of the best family vacations of their lives. Maybe it is the Aloha that resides within the house because of the blessings during construction. Or maybe it is the floorplan that has plenty of private places for two or more people to sit and 'talk story' like the Hawaiians. Or maybe it is the location, just 40 seconds walk to the ocean and two minutes stroll to swimming and sunning at Brennecke's Beach in Poipu Beach Park. Whatever the reason, they have left behind hundreds of warm comments in our guestbook, and you can see every one of them by clicking on our 'Guest Comments' section. 'Maluhia ma ka Honua' (Peace on Earth) is a private, luxurious Kauai rental vacation home located just steps to the oceanfront at Poipu Beach Park on the south shore of Kauai. It is a great home for family vacations or for very private Kauai honeymoons after a romantic Hawaiian wedding. 'Maluhia ma ka Honua' was built in 1998. It is a luxurious 2650 square foot beach house designed with the feel of an original plantation and detailed, decorated, and appointed to perfection. Beneath a vaulted, fan-cooled ceiling, the large, modern kitchen and the huge great room open up to the surrounding 1300 square foot covered lanai. Three spacious bedrooms each have a large, private bathroom, and every room is cross-ventilated for comfort. Three wonderful restaurants are within walking distance and at least nine others are nearby. Two resorts with Robert Trent Jones golf courses are within one mile. This house is 'value priced' to give you a wonderful Kauai vacation and give you good value. You will spend so much time and money just getting to Kauai, and the rental cars and meals can be expensive. You deserve to stay in a really nice home and Maluhia ma ka Honua is nice enough that it would easily rent for $700/night if it were one house closer to the ocean. So come and take advantage of this great value and enjoy this spectacular house. This house is fully licensed by the County of Kauai! (#TV3716) and has a Kauai property manager within three miles of the house. Aloha from Jim and Valorie Wisda. We recentlyt moved to Scottsdale, Arizona from Palos Verdes Estates, California where we raised a wonderful son and daughter. We have been coming to Poipu since 1970 and no matter how often we travel to other places or countries we visit like this photo taken on a Bangkok river boat, we always look forward to coming back to Poipu several times a year. We are used to nice things in our mainland home and that is how we built Maluhia ma ka Honua, to be our home on Kauai. We could have built it anywhere on the island, but for one or two week stays Poipu cannot be beat because it has the best weather possible. We also wanted to be near the action, walk a short distance to the beach and a couple of restaurants. This location has a nice little micro-climate because it is in the leeward side of a small hill. Families love this house. There is something special about the design that induces families to spend a great deal of time "talking story" and getting to know each other better. Dinners seem to last longer as memories are made. Poipu is a great resort town. The Grand Hyatt is just one mile away. One house back from the ocean. Great ocean views from the upstairs bedrooms. Telephones are provided for local calls. For long distance calls, please bring your cell phone. Two car garage, but parking on the street is easier. Sofa, loveseat and chaise lounger seats six. Electric black glass GE range. Previous guests have left spices. We try to provide saran wrap, aluminum foil, baggies, dish and dishwasher soap, paper towels and napkins, coffee filters ++++. Sometimes they run out but we try. Modern kitchen supplied with almost everything a chef/cook needs to feed the family. The racetrack oval glass dining table seats eight. Outside there are two four person dining tables, one for breakfast and one for dinner. Televisions in Living Room and both Master Bedrooms. Separate game table. Games and puzzles. Previous guests have left some sand toys. Previous guests have left a few DVD's. The large lawn is great for children's play and for sunbathing when you don't feel like walking to the beach (during children's naps, for example). Ocean view balcony adjacent to the upstairs master bedroom suite. Previous guests have left masks, snorkels, and fins which you are welcome to use. Please be sure to wash the snorkels before use. Poipu Athletic Club is private but may have weekly family memberships available. Knudsen Park has public courts. Kiahuna Golf Club (18 holes) is one mile west. Poipu Bay Golf Resort (18 holes) is one mile east. Kukuiolono Park (9 holes) is 15 minutes drive. This Kauai rental vacation home has two master bedroom suites with king-size beds & over-sized private bathrooms, third bedroom has 2 twin beds & a private bathroom, There are sleeping arrangements for up to six people maximum, High-Speed Cable Internet (wireless and wired), Lava-enclosed gas barbecue, No Smoking Allowed, This is a large, well-furnished home features 2650 square feet inside with 1300 square foot covered lanai outside. Hair dryers. House was beautiful and location was outstanding. We went to the beach every day to snorkel and boogey -board. Thank you for the opportunity to purchase this at the "Fresh Start" auction. This was our second time staying at this house and it was wonderful. We love the house itself and the location is perfect. We visit Kauai annually and have stayed in a number of homes in Poipu. For us, this property stands out as the best given the quality of the home and its design, how well it is maintained, and its location so close to the state park. We were fortunate to be able to book it again for next February and look forward to our return. We stayed over the Christmas holiday and it was everything that our extended family needed. We have been coming to the Poipu area for family vacations for the last 20+ years and this was by far the most relaxing stay. We really enjoyed being able to walk to Poipu Beach for a daily snorkel. The size of the house is wonderful - enough room for the 5 of us (3 adults, 2 kids) and everyone had nice bathroom accommodations. The kitchen was ideal for preparing meals, including a large Christmas dinner. The wrap around lanais were perfect areas to relax and listen to the ocean and rain while reading. We can't wait for our next trip - we will definitely be back! Everything as advertised and more. It was “our” home from the moment we walked in until we left. Location is the best near dining and beaches and activities and rhe house was perfect. Large rooms and plenty of space for our family of 6 adults. Plenty of outside options to relax on each side of the house - depending on the time of day and the sun! Well stocked kitchen as well. Hope to come back again and again over the years. Thanks Buzz for sharing your home with us. A wonder place on Kauai! Perfect for a large group- just walk to the beach for a sunset - turtle - seal or even a swim! Near this Kauai rental vacation home is whale watching, sea turtle watching, and relaxing, Beautiful Sunsets are always available at no extra charge!!!! 14 night minimum during Christmas. Cancellations: Up to 90 days prior to arrival, first payment is returned, minus a $50 cancellation fee. Within 90 days of arrival, damage deposit and cleaning fee are returned. We will try to re-rent and forward any net rents we receive to you.